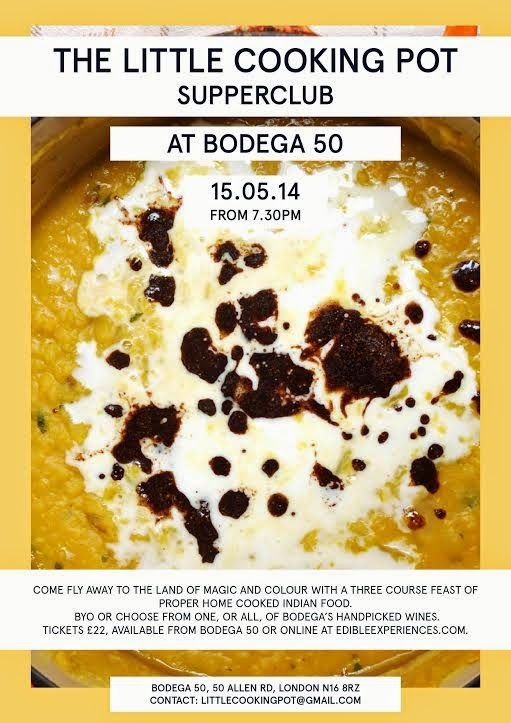 The Little Cooking Pot supper club runs regular vegan events at Bodega 50 cafe in Stoke Newington. Last time was Mexican; on Thursday 15th May it's Indian - featuring 3 courses of gluten-free vegan Indian food, including a cumin spiced cucumber & peanut salad, and all for £22, with BYOB. "Mmmm it smells good in here. The Little Cooking Pot has been bubbling with Indian spices lately. Mexico was lots of fun but we're flying back to the magic and madness of India. Come be transported away with a three course vegan feast of proper home cooked Indian food. The recipes come from the true experts; the Indian mumma's, life long market sellers and street food aficionados who I was lucky enough to cook with on my travels around India.